The fact that Wilson is an investor in 'Recovery Water' has nothing to do with it, of course. If you watched the Seattle Seahawks play the Green Bay Packers in January’s NFC Championship Game, you saw Russell Wilson take a nasty hit to the head. Now Wilson is claiming the reason he didn’t get a concussion is a new miracle sports drink called Recovery Water—a product in which he happens to be an investor. After this incident, Wilson not only went on to play out the rest of the game, he also played the Super Bowl with no problems two weeks later. Sports Illustrated reports that while the NFC Championship Game was happening, Seattle’s team doctors didn’t check Wilson for a concussion on the sidelines. Wilson’s Twitter comment comes on the heels of a Rolling Stone interview he did where he tried hard to spread the gospel of Recovery Water like a true believer. 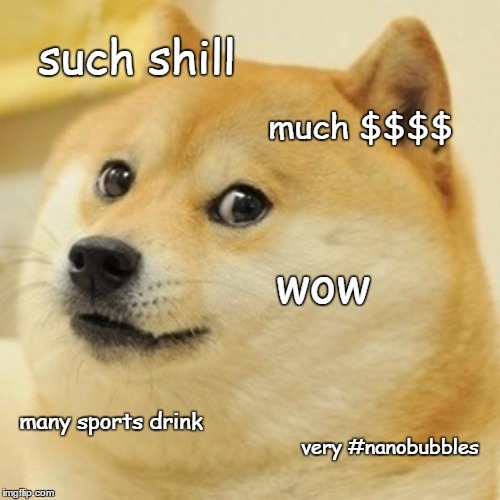 Wilson can believe what he wants, and we get that he wants to make a profit on his $3 bottles of #Nanobubble-enhanced water. But we don’t know how many athletes are going to switch allegiance from Gatorade anytime soon without hard scientific evidence to back up those claims. However, hard head hits that might have caused concussions weren’t one of the things tested by study participants, and the Recovery Water formula wasn’t what the study authors tested. Maybe Wilson really believes the hype, or maybe he just got hit harder in the head than he thought. But there’s a problem with making players believe that water can prevent concussions: According to ESPN, dozens of former NFL players suffer from a type of brain damage, a “crippling neurodegenerative disease” called CTE, that is caused by concussions and head trauma. The NFL recently settled a class-action lawsuit between the NFL and thousands of former football players, who claim that the league knew for years of the link between concussions and long-term health problems. Looks like Wilson might want to start taking those concussions more seriously, and not rely solely on Recovery Water to deal with his head trauma.